"AD" and "Before Christ" redirect here. For other uses, see Anno Domini (disambiguation) and AD (disambiguation). "Christian era" redirects here. For other uses, see Christian era (disambiguation). 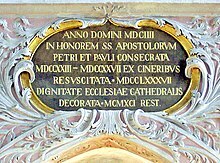 Anno Domini inscription at Klagenfurt Cathedral, Austria. The terms anno Domini[a] (AD) and before Christ[b] (BC) are used to label or number years in the Julian and Gregorian calendars. The term anno Domini is Medieval Latin and means "in the year of the Lord", but is often presented using "our Lord" instead of "the Lord", taken from the full original phrase "anno Domini nostri Jesu Christi", which translates to "in the year of our Lord Jesus Christ". This calendar era is based on the traditionally reckoned year of the conception or birth of Jesus of Nazareth, with AD counting years from the start of this epoch, and BC denoting years before the start of the era. There is no year zero in this scheme, so the year AD 1 immediately follows the year 1 BC. This dating system was devised in 525 by Dionysius Exiguus of Scythia Minor, but was not widely used until after 800. The Gregorian calendar is the most widely used calendar in the world today. For decades, it has been the unofficial global standard, adopted in the pragmatic interests of international communication, transportation, and commercial integration, and recognized by international institutions such as the United Nations. Traditionally, English followed Latin usage by placing the "AD" abbreviation before the year number. [c] However, BC is placed after the year number (for example: AD 2019, but 68 BC), which also preserves syntactic order. The abbreviation is also widely used after the number of a century or millennium, as in "fourth century AD" or "second millennium AD" (although conservative usage formerly rejected such expressions). Because BC is the English abbreviation for Before Christ, it is sometimes incorrectly concluded that AD means After Death, i.e., after the death of Jesus. However, this would mean that the approximate 33 years commonly associated with the life of Jesus would neither be included in the BC nor the AD time scales. The Anno Domini dating system was devised in 525 by Dionysius Exiguus to enumerate the years in his Easter table. His system was to replace the Diocletian era that had been used in an old Easter table because he did not wish to continue the memory of a tyrant who persecuted Christians. The last year of the old table, Diocletian 247, was immediately followed by the first year of his table, AD 532. When he devised his table, Julian calendar years were identified by naming the consuls who held office that year—he himself stated that the "present year" was "the consulship of Probus Junior", which was 525 years "since the incarnation of our Lord Jesus Christ". Thus Dionysius implied that Jesus' incarnation occurred 525 years earlier, without stating the specific year during which his birth or conception occurred. "However, nowhere in his exposition of his table does Dionysius relate his epoch to any other dating system, whether consulate, Olympiad, year of the world, or regnal year of Augustus; much less does he explain or justify the underlying date." In modern times, incarnation is synonymous with the conception, but some ancient writers, such as Bede, considered incarnation to be synonymous with the Nativity. The civil or consular year began on 1 January but the Diocletian year began on 29 August (30 August in the year before a Julian leap year). There were inaccuracies in the lists of consuls. There were confused summations of emperors' regnal years. It is not known how Dionysius established the year of Jesus's birth. Two major theories are that Dionysius based his calculation on the Gospel of Luke, which states that Jesus was "about thirty years old" shortly after "the fifteenth year of the reign of Tiberius Caesar", and hence subtracted thirty years from that date, or that Dionysius counted back 532 years from the first year of his new table. It has also been speculated by Georges Declercq that Dionysius' desire to replace Diocletian years with a calendar based on the incarnation of Christ was intended to prevent people from believing the imminent end of the world. At the time, it was believed by some that the resurrection of the dead and end of the world would occur 500 years after the birth of Jesus. The old Anno Mundi calendar theoretically commenced with the creation of the world based on information in the Old Testament. It was believed that, based on the Anno Mundi calendar, Jesus was born in the year 5500 (or 5500 years after the world was created) with the year 6000 of the Anno Mundi calendar marking the end of the world. Anno Mundi 6000 (approximately AD 500) was thus equated with the resurrection and the end of the world but this date had already passed in the time of Dionysius. The Anglo-Saxon historian the Venerable Bede, who was familiar with the work of Dionysius Exiguus, used Anno Domini dating in his Ecclesiastical History of the English People, completed in 731. In this same history, he also used another Latin term, ante vero incarnationis dominicae tempus anno sexagesimo ("in fact in the 60th year before the time of the Lord's incarnation"), equivalent to the English "before Christ", to identify years before the first year of this era. Both Dionysius and Bede regarded Anno Domini as beginning at the incarnation of Jesus, but "the distinction between Incarnation and Nativity was not drawn until the late 9th century, when in some places the Incarnation epoch was identified with Christ's conception, i.e., the Annunciation on March 25" (Annunciation style). 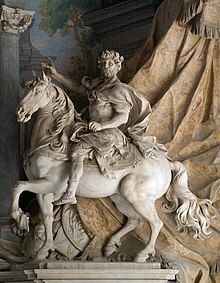 Statue of Charlemagne by Agostino Cornacchini (1725), at St. Peter's Basilica, Vatican City. Charlemagne promoted the usage of the Anno Domini epoch throughout the Carolingian Empire. On the continent of Europe, Anno Domini was introduced as the era of choice of the Carolingian Renaissance by the English cleric and scholar Alcuin in the late eighth century. Its endorsement by Emperor Charlemagne and his successors popularizing the use of the epoch and spreading it throughout the Carolingian Empire ultimately lies at the core of the system's prevalence. According to the Catholic Encyclopedia, popes continued to date documents according to regnal years for some time, but usage of AD gradually became more common in Roman Catholic countries from the 11th to the 14th centuries. In 1422, Portugal became the last Western European country to switch to the system begun by Dionysius. Eastern Orthodox countries only began to adopt AD instead of the Byzantine calendar in 1700 when Russia did so, with others adopting it in the 19th and 20th centuries. Although Anno Domini was in widespread use by the 9th century, the term "Before Christ" (or its equivalent) did not become common until much later. Bede used the expression "anno igitur ante incarnationem Dominicam" (so in the year before the incarnation of the Lord) twice. "Anno an xpi nativitate" (in the year before the birth of Christ) is found in 1474 in a work by a German monk. In 1627, the French Jesuit theologian Denis Pétau (Dionysius Petavius in Latin), with his work De doctrina temporum, popularized the usage ante Christum (Latin for "Before Christ") to mark years prior to AD. From 25 March 753 AUC (today in 1 BC), i.e., notionally from the incarnation of Jesus. That first "Annunciation style" appeared in Arles at the end of the 9th century, then spread to Burgundy and northern Italy. It was not commonly used and was called calculus pisanus since it was adopted in Pisa and survived there till 1750. From 25 December 753 AUC (today in 1 BC), i.e., notionally from the birth of Jesus. It was called "Nativity style" and had been spread by Bede together with the Anno Domini in the early Middle Ages. That reckoning of the Year of Grace from Christmas was used in France, England and most of western Europe (except Spain) until the 12th century (when it was replaced by Annunciation style), and in Germany until the second quarter of the 13th century. From Easter, starting in 754 AUC (AD 1). That mos gallicanus (French custom) bound to a moveable feast was introduced in France by king Philip Augustus (r. 1180–1223), maybe to establish a new style in the provinces reconquered from England. However, it never spread beyond the ruling élite. The date of birth of Jesus of Nazareth is not stated in the gospels or in any secular text, but most scholars assume a date of birth between 6 BC and 4 BC. The historical evidence is too fragmentary to allow a definitive dating, but the date is estimated through two different approaches – one by analyzing references to known historical events mentioned in the Nativity accounts in the Gospels of Luke and Matthew, and the second by working backwards from the estimation of the start of the ministry of Jesus. Although the last non-imperial consul, Basilius, was appointed in 541 by Emperor Justinian I, later emperors through Constans II (641–668) were appointed consuls on the first of January after their accession. All of these emperors, except Justinian, used imperial post-consular years for the years of their reign, along with their regnal years. Long unused, this practice was not formally abolished until Novell XCIV of the law code of Leo VI did so in 888. The Era of Martyrs, which numbered years from the accession of Diocletian in 284, who launched the last yet most severe persecution of Christians, was used by the Church of Alexandria and is still used, officially, by the Coptic Orthodox and Coptic Catholic churches. It was also used by the Ethiopian church. Another system was to date from the crucifixion of Jesus, which as early as Hippolytus and Tertullian was believed to have occurred in the consulate of the Gemini (AD 29), which appears in some medieval manuscripts. The "Common/Current Era" ("CE") terminology is often preferred by those who desire a term that does not explicitly make religious references. For example, Cunningham and Starr (1998) write that "B.C.E./C.E. …do not presuppose faith in Christ and hence are more appropriate for interfaith dialog than the conventional B.C./A.D." Upon its foundation, the Republic of China adopted the Minguo Era, but used the Western calendar for international purposes. The translated term was 西元 ("xī yuán", "Western Era"). Later, in 1949, the People's Republic of China adopted 公元 (gōngyuán, "Common Era") for all purposes domestic and foreign. In the AD year numbering system, whether applied to the Julian or Gregorian calendars, AD 1 is preceded by 1 BC. There is no year "0" between them, so a new century begins in a year which has "01" as the final digits (e.g., 1801, 1901, 2001). New millennia likewise are considered to have begun in 1001 and 2001. This is at odds with the common conception that centuries and millennia begin when the trailing digits are zeroes (1800, 1900, 2000, etc. ); for example, the worldwide celebration of the new millennium took place on New Year's Eve 1999, when the year number ticked over to 2000. For computational reasons, astronomical year numbering and the ISO 8601 standard designate years so that AD 1 = year 1, 1 BC = year 0, 2 BC = year −1, etc. [d] In common usage, ancient dates are expressed in the Julian calendar, but ISO 8601 uses the Gregorian calendar and astronomers may use a variety of time scales depending on the application. Thus dates using the year 0 or negative years may require further investigation before being converted to BC or AD. ^ The word "anno" is often capitalized, but this is considered incorrect by many authorities and either not mentioned in major dictionaries or only listed as an alternative. ^ The word "before" is often capitalized, but this is considered incorrect by many authorities and either not mentioned in major dictionaries or only listed as an alternative. ^ This convention comes from grammatical usage. Anno 500 means "in the year 500"; anno domini 500 means "in the year 500 of Our Lord". Just as "500 in the year" is not good English syntax, neither is 500 AD; whereas "AD 500" preserves syntactic order when translated. ^ To convert from a year BC to astronomical year numbering, reduce the absolute value of the year by 1, and prefix it with a negative sign (unless the result is zero). For years AD, omit the AD and prefix the number with a plus sign (plus sign is optional if it is clear from the context that the year is after the year 0). ^ "anno Domini". Collins English Dictionary. ^ "anno Domini". American Heritage Dictionary. Houghton Mifflin Harcourt. ^ "BC". Collins English Dictionary. ^ "before Christ". American Heritage Dictionary. Houghton Mifflin Harcourt. ^ "BC". Merriam Webster Online Dictionary. ^ "Online Etymology Dictionary". Retrieved 4 October 2011. ^ Blackburn & Holford-Strevens 2003, p. 782 "since AD stands for anno Domini, 'in the year of (Our) Lord'"
^ a b Blackburn & Holford-Strevens 2003, pp. 778–9. ^ Eastman, Allan. "A Month of Sundays". Date and Time. Archived from the original on 6 May 2010. Retrieved 4 May 2010. ^ Chicago Manual of Style 2010, pp. 476–7; Goldstein 2007, p. 6. ^ Blackburn & Holford-Strevens 2003, p. 767. ^ Blackburn & Holford-Strevens 2003, p. 778. ^ Teres, Gustav (October 1984). "Time computations and Dionysius Exiguus". Journal for the History of Astronomy. 15 (3). pp. 177–188. ^ Mosshammer, Alden A (2009). The Easter Computus and the Origins of the Christian Era. Oxford. pp. 345–347. ^ Blackburn & Holford-Strevens 2003, p. 881. ^ "General Chronology". New Advent Catholic Encyclopedia. Vol III. New York: Robert Appleton Company. 1908. Retrieved 25 October 2011. ^ Steel, Duncan (2000). Marking time: the epic quest to invent the perfect calendar. p. 114. ISBN 978-0-471-29827-4. Retrieved 1 June 2010. ^ Hunt, Lynn Avery (2008). Measuring time, making history. p. 33. ISBN 978-963-9776-14-2. Retrieved 1 June 2010. ^ Petau, Denis (1758). search for "ante Christum" in a 1748 reprint of a 1633 abridgement entitled Rationarium temporum by Denis Petau. Retrieved 1 June 2010. ^ C. R. Cheney, A Handbook of Dates, for students of British history, Cambridge University Press, 1945–2000, pp. 8–14. ^ Dunn, James DG (2003). "Jesus Remembered". Eerdmans Publishing: 324. ^ Kepler, Johann; Vlacq, Adriaan (1635). Ephemerides of the Celestiall Motions, for the Yeers of the Vulgar Era 1633... Retrieved 18 May 2011. ^ Sliter, Robert (1652). A celestiall glasse, or, Ephemeris for the year of the Christian era 1652 being the bissextile or leap-year: contayning the lunations, planetary motions, configurations & ecclipses for this present year ... : with many other things very delightfull and necessary for most sorts of men: calculated exactly and composed for ... Rochester. London: Printed for the Company of Stationers. ^ The History of the Works of the Learned. 10. London: Printed for H. Rhodes. January 1708. p. 513. Retrieved 18 May 2011. ^ Raphall, Morris Jacob (1856). Post-Biblical History of The Jews. Moss & Brother. Archived from the original on 11 May 2011. Retrieved 18 May 2011. The term common era does not appear in this book; the term Christian era [lowercase] does appear a number of times. Nowhere in the book is the abbreviation explained or expanded directly. ^ Robinson, B.A. (20 April 2009). "Justification of the use of "CE" & "BCE" to identify dates. Trends". ReligiousTolerance.org. Goldstein, Norm, ed. (2007). Associated Press Style Book. New York: Basic Books. ISBN 0-465-00489-X. Riggs, John (January 2003). "Whatever happened to B.C. and A.D., and why?". United Church News. Retrieved 19 December 2005. Ryan, Donald P. (2000). The Complete Idiot's Guide to Biblical Mysteries. Alpha Books. p. 15. ISBN 0-02-863831-X. Look up AD or Anno Domini in Wiktionary, the free dictionary.